Discussion in 'Electronics' started by Lenny63, Feb 7, 2019. Would any obe be kind enough to get me the part number for a rear same in my cls55?? There was a number of revisions. The latest is highlighted at the bottom. Dronsfield merc breakers are confirming rhey have a compatible module parr no ending "67 01" and they got this from EPC? Would you mind checking for me? This is the "upper" half of the list with part numbers. The "67 01" is compatible with your chassis. Just make sure you replicate the layout of relays / fuses according to your original SAM. Don't think you can go wrong with either of the versions. 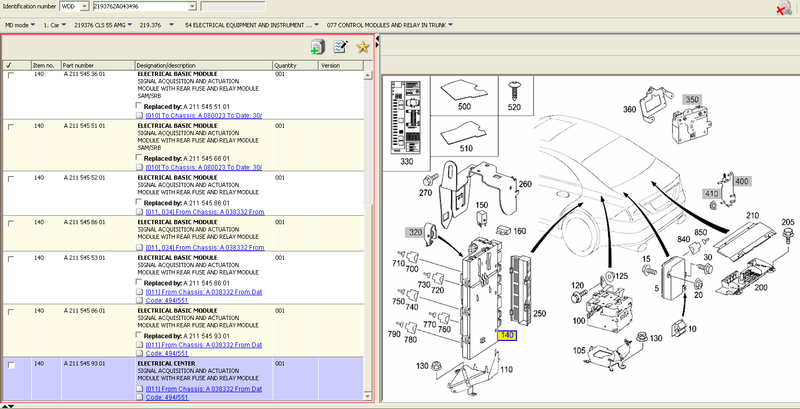 Also, upon installation of the SAM, go into Star/SnapOn diagnostics and make sure you can talk to it. This is the "upper" half of the list with part numbers. Hi Alex, just wondering why both our pics are different? We both have the VIN in the top yet mine only shows the three relevant numbers? Probably different versions of the same software Bob. May be one has access to the online version via the MB owners club, so will list all part numbers applicable. Possibly, but the 'all part numbers available' can be obtained without the VIN. 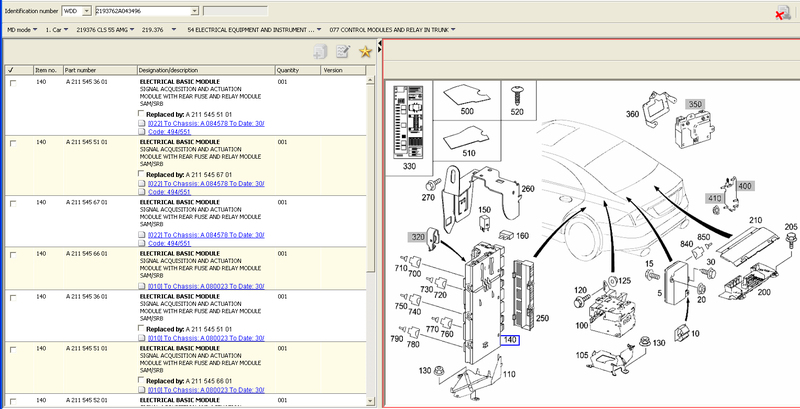 However when the VIN is entered it should only display the parts relevant to that VIN.